I've seen this gem, directed by Bradley Cooper, twice already and can't sing its praises enough. 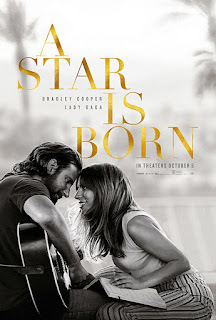 I'm not an emotional person by nature nor, was I a Lady Gaga fan, but this movie stirred all sorts of emotions in me, in the best possible way. Lady Gaga is a struggling service worker with a beautiful voice. Bradley Cooper, is a rock musician with addiction issues and a hearing disability, who by chance discovers Ally's musical talent and a quick mutual attraction draws them together. The two are amazing, the acting, the singing -- just the perfect chemistry and the music is so moving. It's funny, I've never been a Barbra Streisand fan, so the 1970s version of this movie never really appealed to me, but, this modern version, IMO, is not to missed. Have you seen it? I'd love to hear your thoughts. I had to purchase the soundtrack, so awesome. We haven't seen it but it does sound really good! Hope to see it soon!! my wife and I are in the minority this one. We liked it but didn't love it like lots of our friends have. We thought it was too long. But the acting and music were both very good. The movie that I flipped for was The Greatest Showman. I listen to the CD over and over again. And I saw the movie twice in the theaters, which I never do. It's like books, TV shows, et al. It grabs some and not others. It's gotten great reviews, can't wait to see it. Saw the 1970s version with Barbara - made quite an impression at the time, I was at that age. Seems like the movie is looked on as dated and corny now though. My husband liked the 1970s version a lot (not me) but he also thought this was great as well. Haven't seen it yet but even the trailer grabbed me. I hope you will see and enjoy this one. WOW - cousin Kris?? really? I'd love to see this, Diane. I've heard good things about it, and have just read your very positive review. I hope you do see this one. I can't imagine too many not liking this one. I haven't seen this and wasn't sure that I wanted to, but maybe I will. I loved the original A Star Is Born and I've been wanting to see this new version. Now that I've read your review I want to see it even more. "Wow" is the word I keep hearing from my friends who have seen this. Hoping to see it tomorrow! We saw it last week and I, too, had to buy the soundtrack. I'm just disappointed that the script clips contain some of the movie's foul language, which precludes me from playing this for anyone.